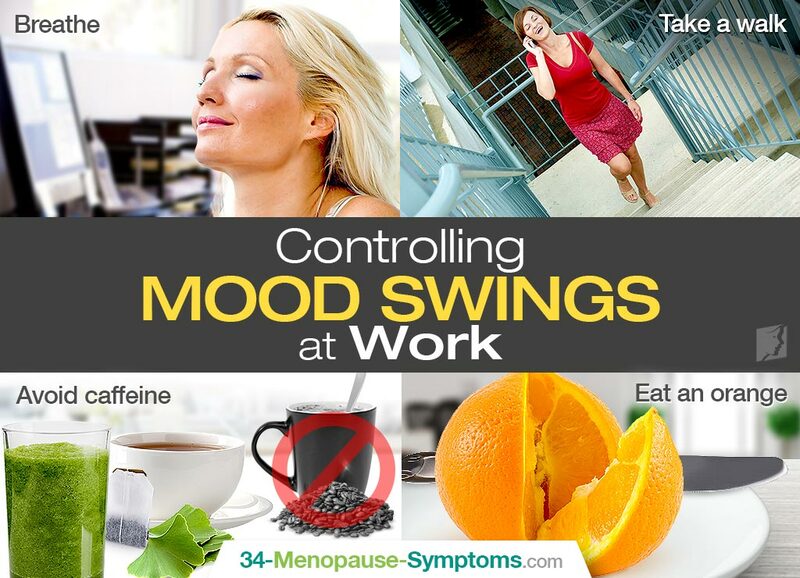 Controlling mood swings at work can be much more difficult, because you don't have the options and freedom that you do when you're in the comforts of your own home or out in nature. Unfortunately, this is a very common symptom of menopause that frequently results in feelings of anger, depression, and intense anxiety. Luckily, there are some simple and effective adjustments you can make to your work day to make it significantly more pleasant. Don't underestimate the power of deep breathing. If you ever feel overwhelmed by your assignments or upset by a coworker or boss, do not let feelings of anger, rejection, or anxiety build. Instead stop everything that you're doing, close your eyes and breathe deeply. Inhale deep into your belly for 5 seconds, and then exhale your worries for five seconds. If the option is available you can also put on your headphones and listen to your favorite uplifting song. Another relaxation method for controlling mood swings is to take a quick walk. You can either do this during your break or ask for permission to go for a quick 10-15 minute walk from your advisor. If you work in a building, take the stairs down and then enjoy a brisk walk in the sunshine. Not only can the vitamin D from the sun enhance your mood, the movement actually can increase serotonin and endorphins; keeping you happy and relaxed. Also, the increased blood flow will make your more clear-thinking and productive when you return. Although coffee is an easy and convenient way to get a quick burst of energy, it may not be the best option. This addictive stimulant drug is habit-forming, and so it can be hard to give it up, but you will be happy you made the effort. Caffeine is known to worsen mood swings by making you more irritable, fatigued, and even depressed. Replace your caffeine cup with completely caffeine free, and deeply beneficial wheat grass or ginkgo. These caffeine free alternatives increase oxygen flow to the brain, improve mood, and provide mental sharpness. Nothing can brighten your day like a tasty snack to look forward to. Oranges are a fantastic choice for controlling mood swings. From peeling it open until your last slice, you emotions can be lifted. The peeling process releases the uplifting citrusy scents that aromatherapy experts have found to exude feelings of joy and light-heartedness. Then when you bite in the juicy, sweet flavor energizes the mind while simultaneously increasing your levels of vitamin C, which research has found to enhance mood. Savor the experience. Taking and deep breath and snacking on an orange can really make all the difference in controlling mood swings. Although sometimes the tasks at hand may be more than you care to handle, when you incorporate these simple tips you will feel more in control. Whether it's a tedious assignment, frustrating coworkers, or sudden hormonal shift getting you down, pull yourself back up easily.